Just the other day I passed a Volkswagen Eurovan Camper following a VW Routan also with some kind of camper mod that didn't say Westfalia on the top. It was right, but also not right at the same time. It might as well have been the Chrysler Town & Country three cars back wearing the Routan's pop-up tent hat. We know a VW Transporter looks right as a camping vehicle, but even bad ones are relatively expensive these days for what's still smaller than a room at a Motel 6 and still doesn't have a bathroom. It's probably the best known of all of these van campers, but are there viable alternatives that are more spacious or more efficient or cheaper? It takes only a look inside this 1967 Dodge A108 camper van to understand what kitchens of the late 1960s looked like. As time machines on eBay go, this is a pretty good one. It is a vast vehicle, though, and one that would dwarf a VW model for road presence, if not outright usability. It's also equipped with a Slant-6 that makes some power, which is useful. OK, your Westfalia conversion is probably going to be more accommodating than this. I'm not fond of the curtains in the Dodge and would swap them out for a more tasteful print, but that's an easy fix. It's a project car for someone who doesn't want the typical camper van, although it's actually going to need a lot of work to bring it more up to date. Which means if I had to go out and buy something that I could, say, use as a cross-country road trip vehicle that doubles as a motel room, I'd buy something with a tall roof and a small engine for good fuel economy. Hey, a Ford Transit Connect makes sense. Actually it really does, thanks to the fact it comes wearing a tall hat from the factory. Efficiency is the key here, though, because with a four-cylinder and compact dimensions there is a fair amount of space and power here. Unlike the Dodge, though, its size does restrict how many amenities you can put inside. And the conversion from cargo to camper in this one really does look like the owner just put some beds in the back and added some pockets for storage. It was, however, used in this decade. The Transit Connect makes a lot of rational sense as a camper, though, and I'd defend it more if someone devises a way to make it more accommodating – especially for $17,000. 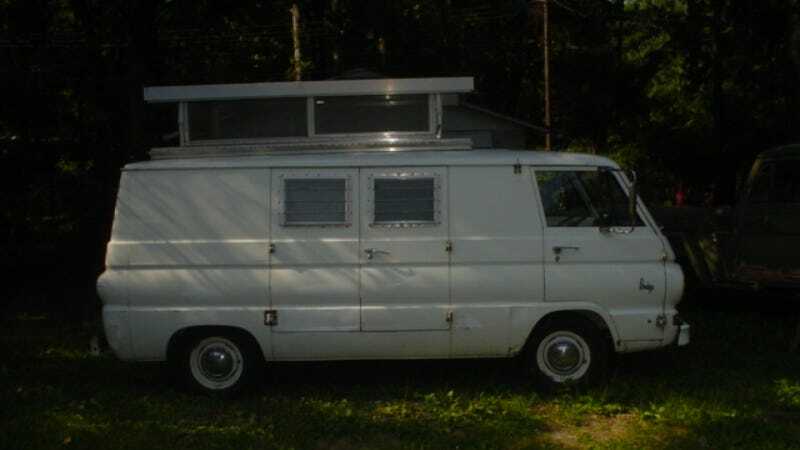 Between the two, though, I'd work on being a little handier and fixing up the Dodge into a viable old camper that isn't a VW. Of course, I'm starting to see why campers tend to be VWs. Now I just need to find that Routan driver and ask what the hell he was thinking.